A Handy End of Summer Home Maintenance Checklist! Every season can take a toll on your home’s exterior, but the summer heat can be particularly destructive. When the dog days of summer give way to the cool breeze of fall, be sure to take some time to give your property a once-over and make the necessary repairs as needed. Clean your gutters and check spouting for clogs. Gutter debris can create tremendous problems if not cleaned regularly. Removing brambles, seeds and leaves from your spouting system in the fall ensures you won’t have to worry about ice dams and falling icicles over the winter. If possible, run a hose through your gutters and spouting to check the system’s integrity. Replace leaky areas or call a professional to make necessary repairs. This is also a great opportunity to consider having seamless gutters installed or replacing your spouting system if necessary. You might even want to consider putting gutter guards onto new or existing gutters to help debris from clogging them. Clean your windows and repair gaps. Cleaning your windows is a great way to inspect them, as well. Make sure there are no window gaps where hot or cold air can escape, and make minor caulking repairs as needed. You may find repairing or sealing gaps simply isn’t enough. If that is the case, consider having replacement windows installed before it gets cold. Protect your deck. Remove debris buildup on your deck, clean your deck boards thoroughly and apply a sealant stain after removing your deck furniture. Check for curling, loose joints and fittings, and inspect the deck’s overall stability. If your deck is off your second floor, have a professional inspect the reliability of the joists and posts underneath. Check siding. Buckling siding, blistering paint or other surface anomalies can be indicative of bigger problems. They can also escape the casual glance, so inspect your siding thoroughly. Holes can mean insect infestations, fading can mean it’s time to upgrade, and mold or mildew can indicate water damage. If you need your siding repaired or replaced, don’t want until it’s too cold. Inspect your roof and soffits. Inspecting your roof doesn’t just mean climbing up and taking a look. Go beyond a visual inspection, by checking your roof for soft spots and testing the integrity of the shingles. Loose shingles should be replaced, and soft spots should be scrutinized more closely. Curling or brittle shingles, shingles falling off, or stones in the gutter or downspouts are some other signs that your roof needs to be replaced. Check your soffits (the overhangs between your siding and roofline) for discoloration, which could mean you have a leak. Likewise, check your attic for any ceiling stains that might also spell trouble. Add or replace weather-stripping on exterior doors. The weather seals around doors can disintegrate over time, leaving gaps that can expose you and your family to cold or hot air. This can result in higher utility bills and even allow insects an entryway into your home. Attaching new weather-stripping is a fast and efficient way to mitigate the problems created by worn-out weather seals. Clean, prepare and store your awnings. Before retracting or removing your awnings for the season, brush off dust and debris, hose them down and clean them with a solution of soap an water using a soft-bristle brush. Allow your awnings to dry completely in the sunlight, then – if they are to be removed – store them in a dry area with plenty of ventilation. If they are retractable, remove the hanging valance, cover it and store it in a dry area. Hose off and clean out your outdoor garbage bins. Animals and rodents have a strong sense of smell, and colder weather can create desperation among certain species. Mice, particularly, have a heightened sense of smell and a wide, varied diet. Cleaning your outdoor garbage bins and removing any temptations can ensure critters don’t set up camp nearby and cause problems in other areas of your home. At this point, many of us know the dangers of sedentary lifestyles. From obesity to heart disease and depression, those of us with a 9-to-5 desk job need to make a special effort to stand more and sit less. The great news is you don’t need to bust out a standing or walking desk (although you should if they interest you!). Studies show that as little as seven minutes of moderate physical activity a day can help battle the desk doldrums. Dr. Adrienne Youdim, MD FACP, Associate Clinical Professor of Medicine at the UCLA David Geffen School of Medicine Cedars Sinai Medical Center, offers simple tips to incorporate healthier habits into your day, courtesy of MerckManuals.com. You don’t need an expensive gym membership to get moving – simply create small breaks in your day. Set a timer on your phone to get up and move around every hour. Walk up and down a few flights of stairs or take a loop around the parking lot. Many employers have realized the benefits of a healthy workplace. Research shows active employees are more productive and have lower long-term health care costs. Some companies are now investing in standing desks and small cycles that fit under employee’s desks. If your company offers this kind of equipment, taking advantage of it is a no-brainer. If you can’t find time for an hour-long workout in your daily routine, create the time by setting your alarm just ten minutes earlier. Give yourself a few minutes of physical activity before your day gets crazy. But don’t overlook the importance of sleep. Research points to a close connection between sleep deprivation and obesity and diabetes. Make sure you’re getting at least six hours of sleep (many people need more than that). If you’re getting up earlier to exercise, hit the pillow a few minutes earlier, too. 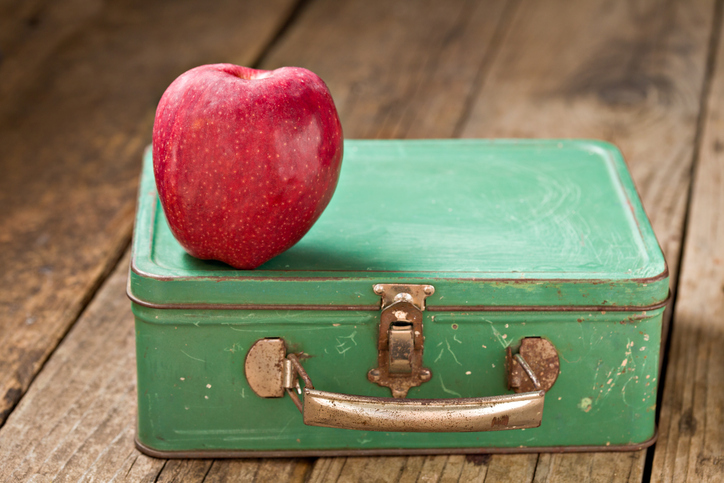 If you do one thing to improve your daily health, make it this: pack a lunch. The average restaurant meal contains two-thirds of your daily calorie requirements. Even a salad can be spoiled by high-calorie dressings. Packing a lunch is an easy way to control your calorie intake. While you’re at it, use the time you would have spent picking up takeout to go on a 15-minute walk at lunch. One short walk and five-minute breaks every hour add up to almost an hour of additional activity a day. Most of us are exhausted by the end of the work day. Even if we have the best intentions to exercise when we get home, it’s easy to lose motivation the second we walk through the door. The key is to find things that motivate you. If there’s a TV show you can’t wait to watch, commit to only watching it while running on the treadmill or elliptical. Keep a log of how you feel after every workout, so you’ll remember how rejuvenated you feel after some physical activity. If you feed off others’ energy, join a group fitness class. Being active doesn’t have to mean doing jumping jacks or logging hours on an exercise bike. Spending time doing something active you love, such as dancing, gardening, fishing, rock climbing or bowling, can provide tremendous health benefits – and you’ll be more likely to stick with it. Once you get started, you’ll start forming habits that make it easier and easier to find the time and willpower every day.